Brazil loses Neymar & Thiago Silva in one single match. Brazil should be celebrating the fact that they have advanced to the World Cup semi-finals. 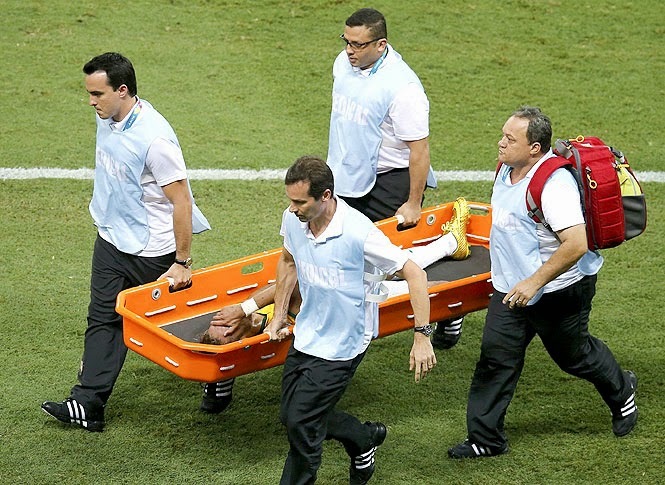 Instead they are concerned over the health of Neymar and how will they be able to cope without their superstar. It all happened during the 87th minute of the Brazil vs. Colombia quarter final match, when Zuniga jumped from behind Neymar and kneed him in the back. At first it didn't look very serious, but when he didn't get up and the stretcher had to be brought in to remove him from the field, you knew that this wasn't something mile that some magic spray could cure. The Brazilian national team doctor later confirmed that indeed the test results conducted at the Fortaleza Hospital, had confirmed that Neymar had a broken lumbar vertebrae and that his recovery time would be from 4-6 weeks. This was not the news Scolari wanted to hear. This puts Neymar out of the World Cup and creates a problem for a Brazilian team. Brazil wins the game against Colombia but lost two of their key players. Neymar is out of the tournament with a horrible injury and the captain, Thiago Silva, will be out of the semi-finals against Germany for receiving his second yellow card. This will mean that Brazil will be missing their two most influential players, for a key game against one of their toughest opponents to date. Scolari will have some very difficult decisions to make in the short term, but I can’t imagine it will be easy to replace either one of these players for the upcoming game against Germany. Thiago Silva can be replaced by Dante at the back, for this one match, but replacing Neymar not only is a difficult thing to do, it is impossible. What he brings to the team cannot be given by anybody else on that roster. While the loss of their captain will be felt, the loss of Neymar is far more reaching and could be the beginning of the end of Brazil’s hopes of winning this tournament. It is unfortunate that Brazil loses its superstar and all the football fans lose one of the brightest stars of this tournament. 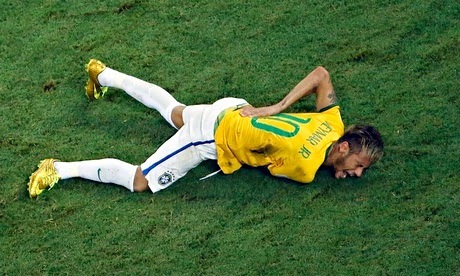 In the end we all lose with Neymar injury, not just Brazil.